The Feminist Library is a large archive collection of feminist literature, particularly Women’s Liberation Movement materials dating from the late 1960s to the 1990s. We support research, activist and community projects in this field. The Library is also an autonomous feminist community space. The Library is trans-inclusive, welcomes visitors of any gender, does not require registration or membership, and provides an intersectional, non-sectarian space for the exploration of feminism. You can view our our Community Policy here. Why not search our Online Catalogue, explore our Collection, or find out more about our Activities and Events. If you would like to find out more about Volunteering or becoming a Friend to support the Library financially, please do get in touch. 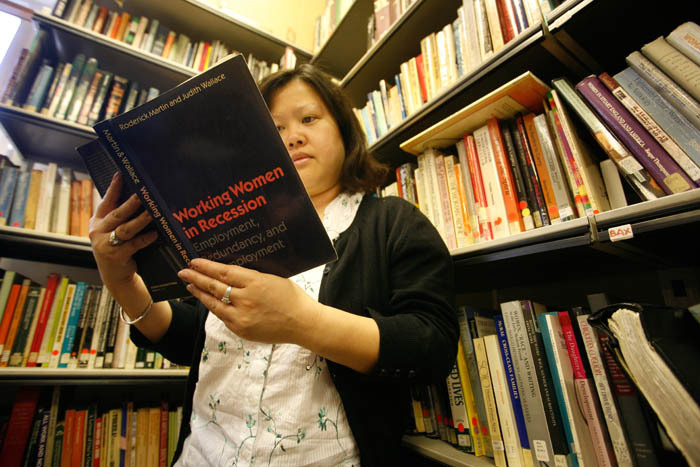 Originally known as the Women’s Research and Resources Centre (WRRC), the Feminist Library was set up in 1975, at the height of the Women’s Liberation Movement (WLM), a time of intense political campaigning and lively collective organising. Learn more about our Herstory here. Since the Library’s beginnings, it has provided a place where women could network and educate themselves, and has become a contact point for women locally, nationally and internationally. Today the Library continues its drive for inclusion and accessibility. The Library is run by a collective of volunteers, with a management structure committed to making decisions by consensus. Read our Manifesta here.